There are many more ways to get the news these days, and as a consequence Americans are spending more time with the news than over much of the past decade. Digital platforms are playing a larger role in news consumption, and they seem to be more than making up for modest declines in the audience for traditional platforms. As a result, the average time Americans spend with the news on a given day is as high as it was in the mid-1990s, when audiences for traditional news sources were much larger. At the same time, the proportion of Americans who get news from traditional media platforms – television, radio and print – has been stable or edging downward in the last few years. There has been no overall decline in the percentage saying they watched news on television, and even with the continued erosion of print newspaper and radio audiences, three-quarters of Americans got news yesterday from one or more of these three traditional platforms. Overall, cable news continues to play a significant role in peoples’ news habits – 39% say they regularly get news from a cable channel. But the proportions saying they regularly watch CNN, MSNBC and CNBC have slipped substantially from two years ago, during the presidential election. Only Fox News has maintained its audience size, and this is because of the increasing number of Republicans who regularly get news there. Four-in-ten Republicans (40%) now say they regularly watch Fox News, up from 36% two years ago and just 18% a decade ago. Just 12% of Republicans regularly watch CNN, and just 6% regularly watch MSNBC. As recently as 2002, Republicans were as likely to watch CNN (28%) as Fox News (25%). 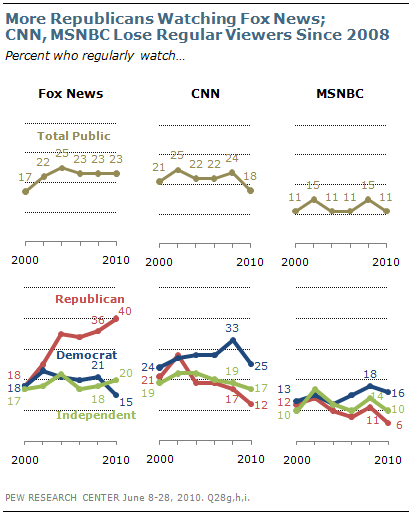 The share of Democrats who regularly watch CNN or Fox News has fallen from 2008. In terms of specific programs, Fox News hosts Sean Hannity, Glenn Beck and Bill O’Reilly have succeeded in attracting conservative and attentive audiences. This is also the case for radio host Rush Limbaugh. 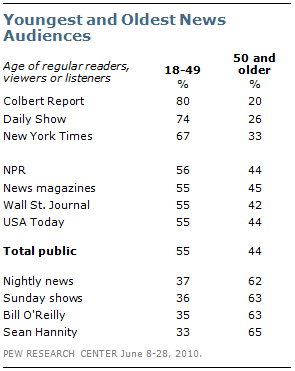 Most of those who regularly watch O’Reilly (63%) and Hannity (65%) are 50 or older; 44% of the public is 50 or older. By contrast, the Daily Show and Colbert Report have the youngest audiences of any outlet included in the survey. Large majorities of those who say they regularly watch the Colbert Report (80%) and the Daily Show (74%) are younger than 50; 55% of public is 18 to 49. Ideology continues to be closely associated with people’s choice of certain news sources. Eight-in-ten Americans (80%) who regularly listen to Rush Limbaugh or watch Sean Hannity are conservative – roughly twice the national average of 36%. And at the other end of the spectrum, the New York Times, Keith Olbermann, the Daily Show, the Colbert Report and Rachel Maddow have regular audiences that include nearly twice the proportion of liberals than in the public. News audiences also vary widely when it comes to opinions about current issues and topics. For instance, those who describe themselves as supporters of the Tea Party movement make up disproportionately large proportions of the audiences for Limbaugh’s radio show and Fox News opinion programs. This also is the case for supporters of the NRA (National Rifle Association). By contrast, supporters of gay rights make up large shares of regular New York Times readers, viewers of the Colbert Report and NPR listeners. Several ideologically divergent news audiences – including Wall Street Journal readers and viewers of the Colbert Report and Glenn Beck show – include larger-than-average percentages of self-described libertarians. 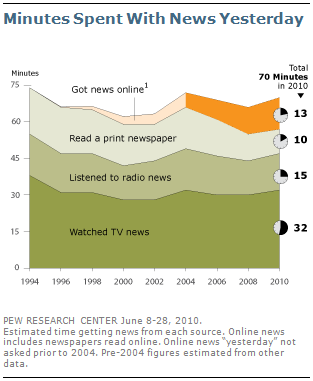 News audiences are drawn to different sources for different reasons. A substantial majority (64%) of regular CNN viewers say they turn to the network for the latest news and headlines; far fewer say they turn to CNN for in-depth reporting (10%), interesting views and opinions (6%) or entertainment (4%). Similarly, the main appeal of network evening news, USA Today and daily newspapers is the latest news and headlines. Regular Fox News viewers offer somewhat different reasons for tuning into that network: 44% say they go to Fox for the latest news, but a sizable minority (22%) volunteers several reasons or say that all apply. Regular readers of the Wall Street Journal and New York Times are drawn particularly by in-depth reporting; 37% and 33%, respectively, say they mostly read those papers for in-depth reporting, the highest percentages for any new outlet. For the audiences of evening cable programs – whether liberal or conservative – interesting views and opinions are the primary appeal. That is the case for regular listeners of Rush Limbaugh as well, although many Limbaugh listeners cite multiple reasons or say that all apply. For some news audiences, such as regular NPR listeners, no single reason stands out as to why people watch, read or listen: 28% of regular NPR listeners cite several, or all, of the reasons listed, while nearly as many say they listen for the latest news (21%) or for in-depth reporting (20%). Entertainment is by far the biggest reason why regular viewers of the Colbert Report and the Daily Show tune into those programs; 53% of the regular Colbert audience and 43% of the Daily Show audience say they mostly watch those programs for entertainment. Yet entertainment also is a factor for many regular viewers of morning news shows (18%), readers of USA Today (16%) and other audiences. 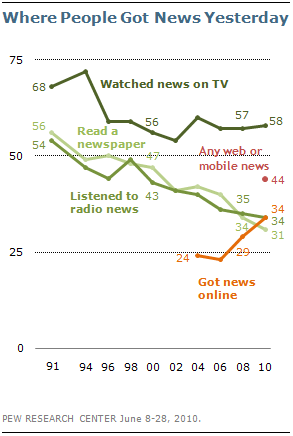 Overall, the share of Americans who say keeping up with the news is something they enjoy a lot has dipped, from a consistent 52% in recent biennial news consumption surveys, including 2008, to 45% in 2010. 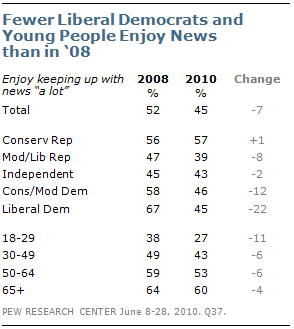 The decline is linked to partisanship and ideology: in 2008 67% of liberal Democrats said they enjoyed the news a lot, compared with just 45% today. By contrast, about as many conservative Republicans say they enjoy keeping up with the news today as did so two years ago (57% now, 56% then). This has resulted in a switch in news enjoyment. Today, conservative Republicans enjoy keeping up with the news more than any other ideological and partisan group; just two years ago it was the liberal Democrats who held that distinction. •While 26% of all Americans say they read a print newspaper yesterday, that figure falls to just 8% among adults younger than 30. •Far more men (50%) than women (39%) get news on digital platforms, such as the internet and mobile technology, on any given day. Men are more likely to get news by cell phone, email, RSS feeds or podcasts than are women. But men and women are equally likely to get news through Twitter or social networking sites. 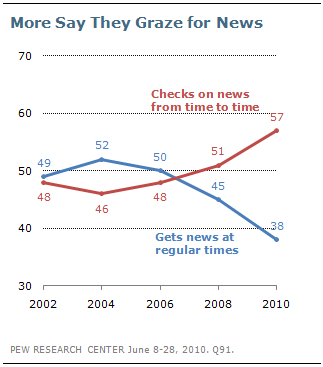 •More people say they mostly get news “from time to time” rather than at “regular times.” The percentage of so-called news grazers has increased nine points (from 48% to 57%) since 2006. •Search engines are playing a substantially larger role in people’s news gathering habits – 33% regularly use search engines to get news on topics of interest, up from 19% in 2008. 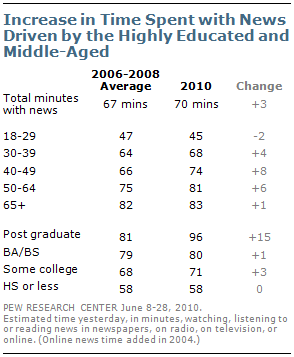 •About three-in-ten adults (31%) access the internet over their cell phone, but just 8% get news there regularly. 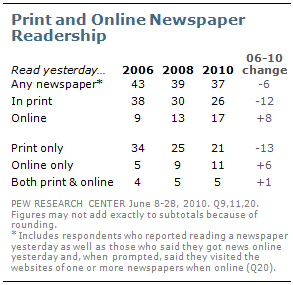 •Most Facebook and Twitter users say they hardly ever or never get news there. •One-in-four adults (25%) who have Tivos or DVRs say they program them to record news programs. •About eight-in-ten (82%) say they see at least some bias in news coverage; by a 43% to 23% margin, more say it is a liberal than a conservative bias. •Roughly a third (35%) read a book yesterday, which is largely unchanged over the past decade. Of those, 4% read an electronic or digital book. •The public struggled with a four-question current events quiz – just 14% answered all four correctly. But about half (51%) of regular Wall Street Journal readers aced the quiz, as did 42% of regular New York Times readers. •Among news audiences, Obama gets his highest approval ratings among regular viewers of Keith Olbermann (84% approve) and Rachel Maddow (80%); his rating is nearly as high among regular readers of the New York Times (79%). 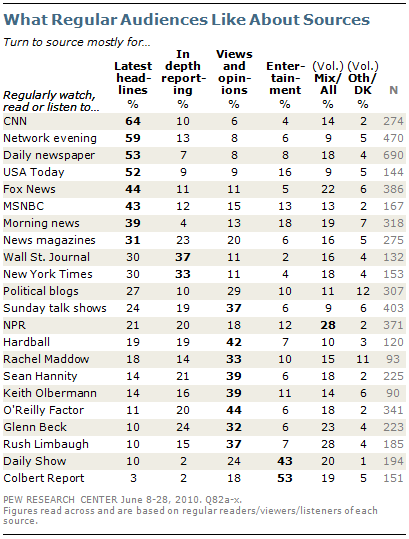 Obama gets his lowest ratings among regular Sean Hannity viewers (7%) and Rush Limbaugh listeners (9%). •Partisan gaps in media credibility continue to grow, with Republicans far more skeptical of most major news sources than Democrats. The one exception is Fox News, which twice as many Republicans believe all or most of (41%) than Democrats (21%).